For the next part of the trip, our friends Eric and Sarah joined us. 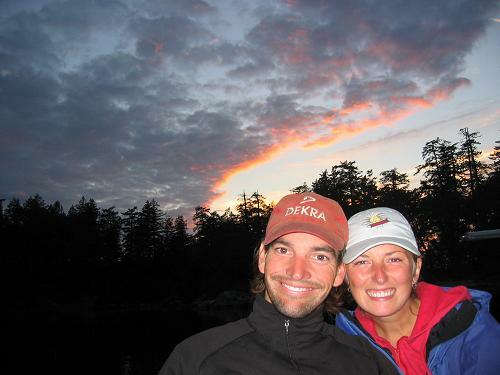 The first few days were with Karen, then after she flew home they stayed on board for deeper explorations into Desolation Sound. The day we picked them up in Lund there was a small craft advisory in effect with local gale force winds. The nor'wester from the previous day was still blowing itself out. We loaded their things aboard then headed out. With a reefed mainsail and 2/3rds of the genoa furled we beat north into the wind and waves. It was exhilarating even if at times Karen thought at times it was a little too exciting. Finally we rounded Sarah point and headed for calmer waters ending up in Galley Bay for the night. After our night in Galley Bay we motored in calm winds to Tenedos Bay. Here we swam in Unwin Lake and just relaxed on board with our books, binoculars, and cool drinks. I took the dingy to shore to take some photos. This shot shows the boat with Sarah and Karen in the cockpit (you'll have to look close). All too soon it was time for Karen to head home. 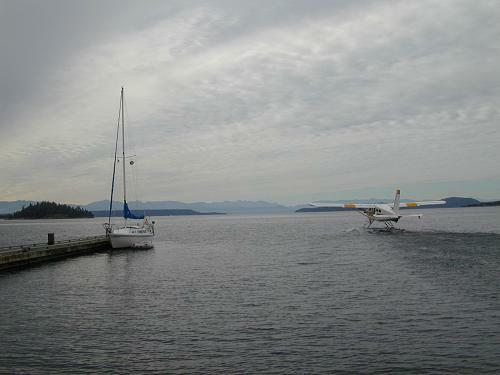 We motored around to Bliss Landing and after a quick lunch we heard her float plane approaching. We only had time for a few kisses and hugs then she got on board and flew back to Seattle. Here is a photo of her plane leaving next to a saddened Gata Luna. 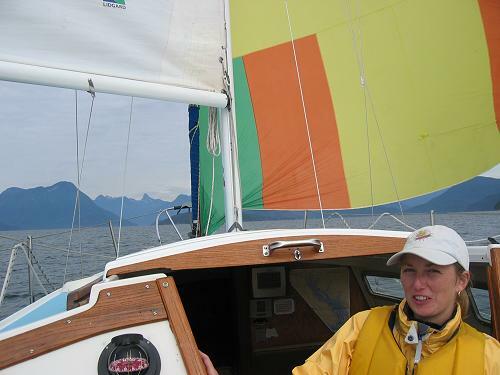 Heading back into Desolation Sound, Eric, Sarah and I decided to try flying the spinnaker. The conditions were perfect and it was fun to try to keep it full of air as we did a dead run to Roscoe Bay - one of my favorite anchorages in the sound. Note the wing-on-wing sail configuration. Sarah looks totally stoked. 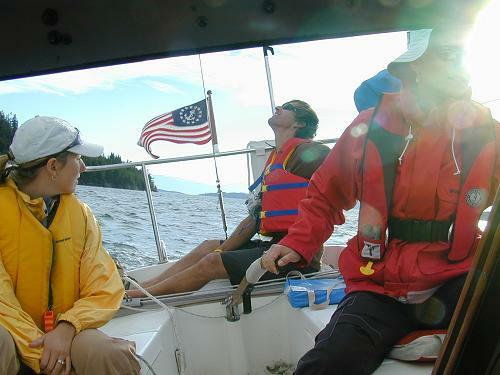 After a night in Roscoe Bay, and a night further north at Walsh Cove we came to the entrance to the Toba Inlet and had a fun sail west tacking back and forth in Pryce Channel. We headed south at Raza Island and then headed down Von Donop Inlet for the night. After this full day of sailing Eric and Sarah were getting to be pros. 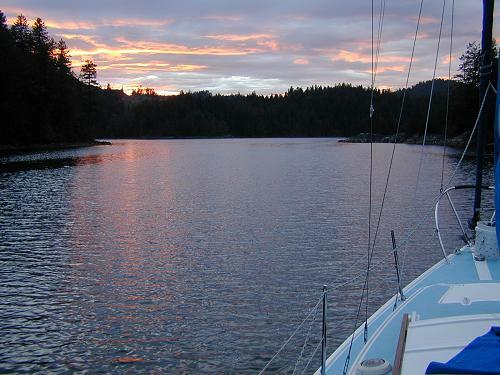 We dropped the anchor in a shallow little bay and enjoyed this sunset before making dinner. Next stop was Gorge Harbor to get water, recharge the batteries on shore power, take showers and pick up a few more supplies. 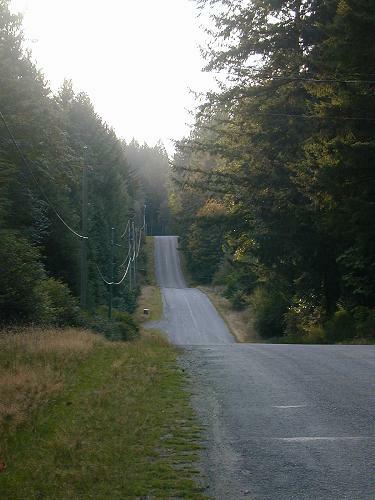 To stretch our legs we took a hike to Whaletown down quiet country roads. On the way back we stopped at an old homestead to pick some apples. 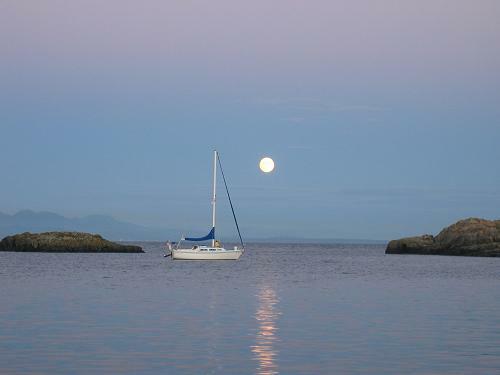 Since the weather seemed settled we decided to sail out to Mitlenatch Island in the middle of the Strait of Georgia. This low rocky island is a wildlife preserve and was full of birds, seals, and sea lions. 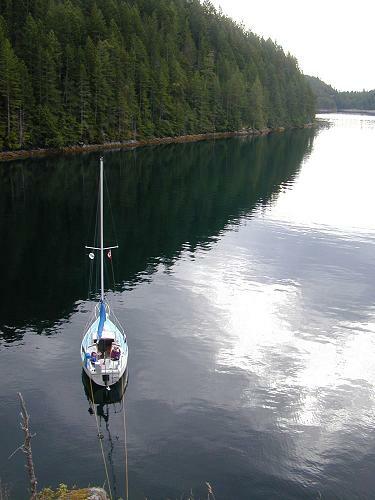 We anchored carefully in a sheltered cove then went ashore for a look. There is a naturalist cabin that is occupied by volunteers in the summer but it was vacant when we were there. Here is the cabin with Gata Luna in the background. This is a shot Eric took of Gata Luna under the full moon. 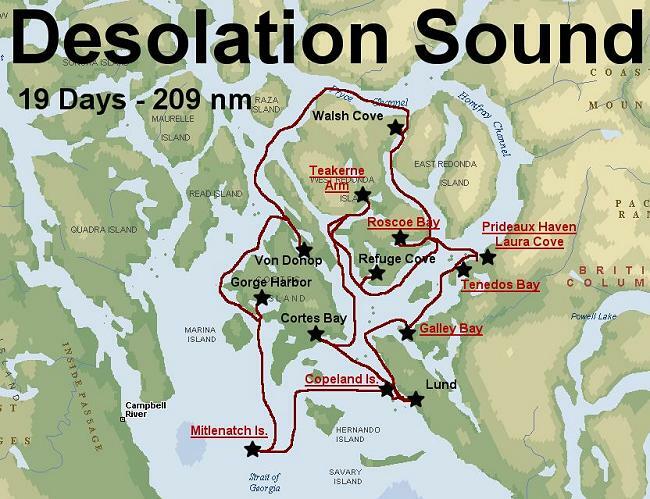 Mitlenatch Island was the most remote feeling place I visited in Desolation Sound. I felt as if we were in the Galapagos. Although I fretted about our anchorage and the next morning's low tide, it was a truly magical place. 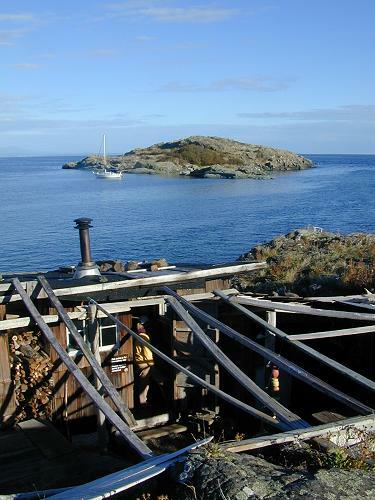 After Mitlenatch we headed to the Copeland Islands for a final night aboard. The next morning we motored to Lund for my last crew change before heading south. Eric and Sarah were great travel companions. It was very comfortable to live on board with them even on a 27 foot boat. This is not surprising since they have been traveling the U.S. and Baja Mexico aboard their own craft - a Sportsmobile Campervan. They have been away from Seattle for about a year so it was a real pleasure to be able to spend so much time with them. By the time I return to Seattle they will be on the road again. You can read about their adventures at www.vanontherun.com.